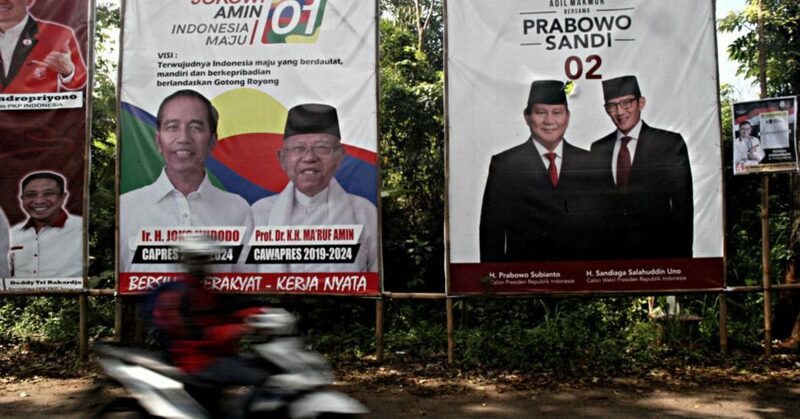 Another area of interest for election watchers is that Jokowi and Prabowo are facing off in a campaign that has become increasingly focused on religion, according to Supriatma. “The two candidates are not so different in that their (general) approaches to the economy and policies are not so different, so they try to draw contrast among themselves through religion,” said Supriatma. Prabowo, in particular, is challenging Jokowi’s presidency by positioning himself as a “defender” of Islam, said Supriatma. The former general has formed a pre-election pact with hardliner Islamist groups, which included a promise to rehabilitate Rizieq Shihab, the leader of the extremist group known as FPI or Islam Defenders Front, who is currently in self-imposed exile in Saudi Arabia. Jokowi himself has chosen a conservative Muslim cleric as his running mate to boost his own religious credentials. That has disappointed some of his supporters as Jokowi campaigned as a progressive in 2014. That comes after Chinese Christian politician Basuki Tjahaja Purnama, also known as Ahok, lost the Jakarta governor election in 2017. He had ignited a series of highly charged protests for purportedly insulting Islam and was later found guilty of blasphemy. Although there are seen to be tensions in Indonesia against ethnically Chinese citizens, in the case of Ahok, much of the anger against him is because he is a Christian, according to Supriatma. “This election will define the role of Islam in Indonesia,” said Supriatma. If Jokowi wins, the Southeast Asian country will likely continue its path as a Muslim-majority country with moderate leanings, he projected, adding that a Prabowo government would be less predictable. “The Islamization of politics is likely to remain an issue under either a Jokowi or Prabowo presidency, even if not posing a severe threat to Indonesia’s secular democracy,” said Eurasia’s Mumford.